Available in store and online, please check the app! only. A delivery charge of £3.95 will be required at checkout IF you use the online code offer. If you use the in store one, it’s free of course to pick up. The countdown to Easter has begun and it’s almost chocolate time. We are giving you the chance to get two delicious chocolate Easter Eggs from Thorntons for just £5. Whether you want to give one to a loved one or gobble them both to yourself, choose from a delicious range of chocolate eggs. You can make your gifts extra-memorable when you personalise your eggs for free in-store. 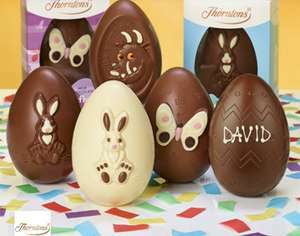 Visit any Thorntons store this Easter and get some fabulous eggs. This Offer entitles you to buy any two small (ranging 149g - 163g each) Easter eggs for £5. Offer applies to a selected range of small eggs only. There is no cash equivalent to this Offer. Purchased eggs can be personally iced for free in-store. Offer valid in Thorntons owned retail stores only.